See other failures under pardo.net/bike/pic. 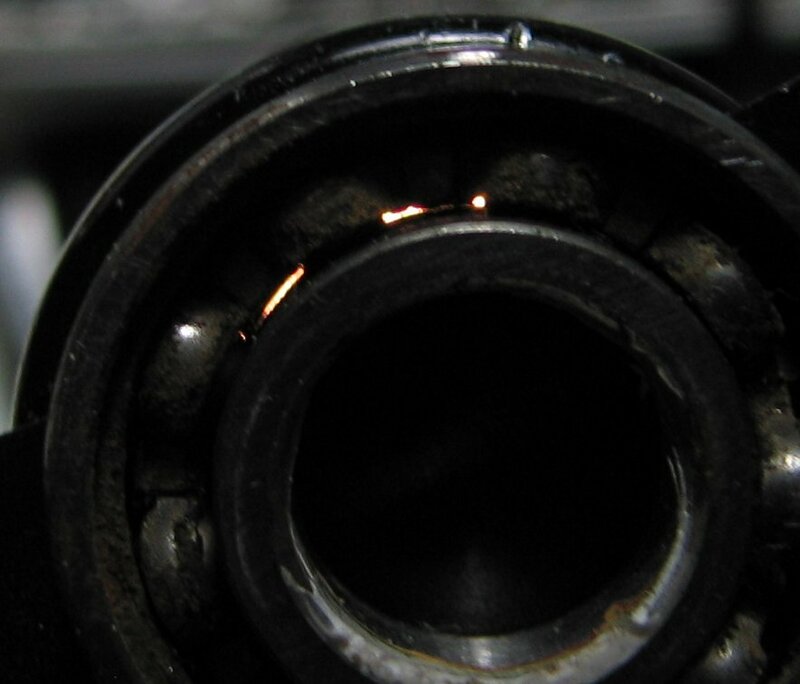 Rolling-element bearings usually fail from fatigue of the races, and fatigue happens much faster when there is grit in the bearings. It has been common since about 2000 for bicycle parts to use industrial cartridge bearings — although industrial bearings have been used at least as far back as the late 1940's in Harden hubs. Most sizes of industrial cartridge bearings are available with a rubber contact seal designed to exclude contaminants and thus improve bearing life. Although the seal is useful, it is not as effective as desired for bicycle use. That is, even with "sealed" bearings, the service life is often short due to grit intrusion. Using bearings at or near their rated capacity will make bearings fail faster for all reasons. Some bearings are undersized for the load and fail quickly even when used in a clean environment. However, using an undersize bearing also accellerates failures from grit intrusion. A first problem is poor seals, typically found on the cheapest bearings. The following shows an inexpensive cartridge bearing with one seal removed then placed on a flashlight. The bright spots show light leaking through the seal. Even a very small gap is a problem, but the light here is fairly bright, indicating a fairly large gap that will allow substantial grit to enter the bearing. Via http://cozybeehive.blogspot.com/2008/09/sealing-on-cheap-bearings.html as of 2010/03. A second problem is that seals wear — even good seals. When mud or other wet grit lands on the outside of the seal, fine grit is drawn in to the seal and rubbed between the moving and stationary parts, causing abrasive wear. Thus, even a seal that starts in good condition will wear out and let grit in to the bearing. Bearing packed with grit due to seal wear. 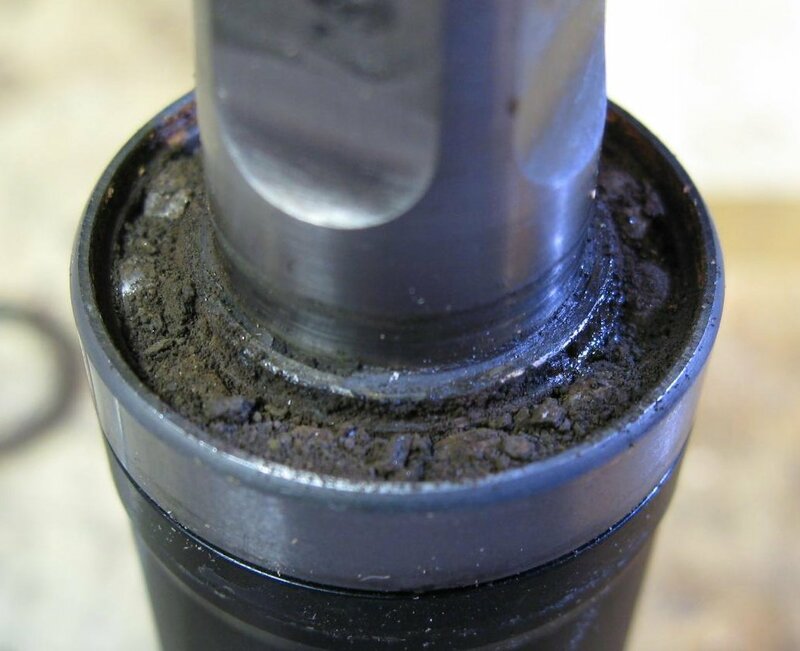 The above picture shows a bottom bracket used regularly in muddy conditions. The bearing is packed full of dried mud and will not turn. The mud got in the bearing despite having an intact — though worn — bearing seal (removed, not shown), and despite a design in which the cartridge bearing seal is protected by an outer O-ring seal. O-ring outer seal to protect bearing inner seal. The O-ring seal is itself prone to wear, and once grit gets past the outer seal it is trapped and so continues to wear the inner seal even after grit is removed from the outer seal. A further problem is the inner and outer seals are close together, making it easier for grit that gets past the outer seal to "churn" across the gap between the seals, thus addding to the grit wearing the inner seal. Some designs, such as WTB's Grease Guard™ allow grease to be added to the bearing without disassembly. 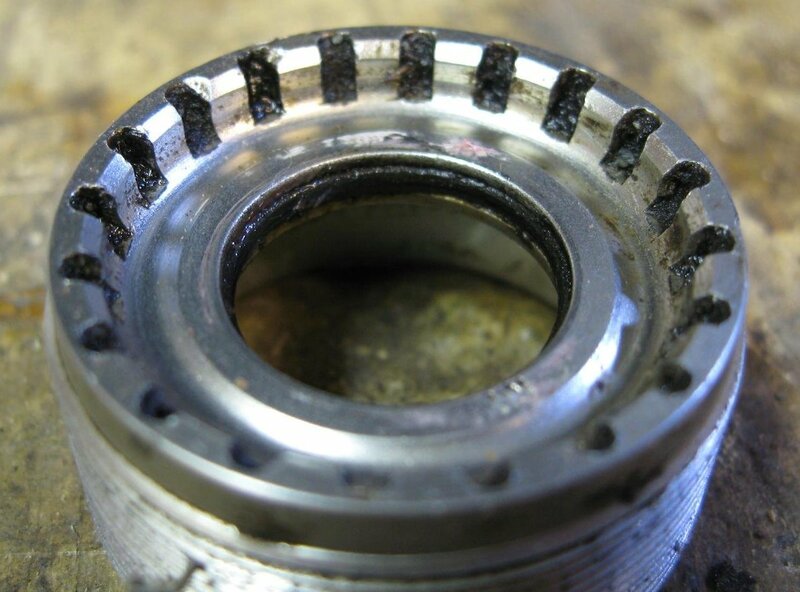 Dirty grease is pushed out by the new grease, and is wiped from the outside of the bearing. However, even when used in "clean" conditions, it is important to continue to re-grease, as grease forms a "bridge" between inner and outer seals and can thus draw grit across a gap, where a lightly-greased bearing would not. Grease "bridge" carries dirt in to bearing. Even in "clean" conditions, there is still dust in the air and also grit thrown up from the road. Thus, grit continually lands on the outside of the seal. Even a tiny amount of grease acts as "fly paper" to hold grit, which in turn causes seal wear. Further, small amounts of small-size grit can work past the seal and thus contaminate grease just inside the seal. As the wheel rotates, the grease is churned repeatedly, which causes some grit near the seal to be carried in to the bearing. Bearing pressures/forces are high, so even small amounts of tiny grit particles can cause damage in the bearings and races. Traditional (1920's to 1960's) English cycles often have an oil filler on the bottom bracket shell. Maintainence is to tregularly add 10 ml of 30W oil, or similar. Oil has the advantage, compared to grease, that it does not bridge gaps well. So, grit that lands on the outside is not churned in to the bearing. After top-up, some oil quickly leaks out, carrying out contaminants, while more leaks out over time. These bearings are usually sealed poorly, with no contact seal, no labyrinth seal, and only modestly close running between spindle and cup. Despite the poor sealing, the bearings often give decades of daily service in wet weather with no maintainance beyond oil top-up. They do, however, tend to make a mess when parked or leaned over sideways.